Netflix has quietly added the the ability to setup your account to rent HD DVDs (with Blu-ray coming later this year). You can access the setup from Your Account page (look for "Account Preferences"). 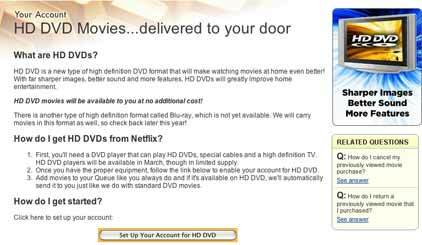 After setting your account up for HD rentals, you can set the default format to DVD or HD DVD. Your Queue will show a new column called "Format:"
I setup my account to default to HD DVD, and out of 330 movies none of them were offered on HD yet. Thanks to Apple, Rodney, and Gregory for sending this in. Thats great! ..if only I had a had player. I gotta give points to Netflix on this. They are on the ball, and it's FREE?! Excellent. I'm sure I won't have a player until around Christmas time, but it's nice to see. I called Netflix and the said this isn't true. Where did you get this info. ? Netflix is pulling all HD by end of year...they're throwing their lot in with Blu-Ray. Make your own life time easier get the loan and everything you require.